Scientists must have spent years perfecting the proper shape of the fabulous Weener Cleaner Soap. Forget about bars or soaps on a rope, this male oriented cleaner is a ring with a hole in the center. After one shower you'll be so refreshed, you'll never want to use another soap to get your nether friend shiny and clean. It doesn't matter your size because the Weener Cleaner Soap is one size fits all. Always remember the instructions: wash, rinse, repeat...and repeat and repeat. You'll have so much fun with the Weener Cleaner Soap that you'll probably need to take a nap after your shower. 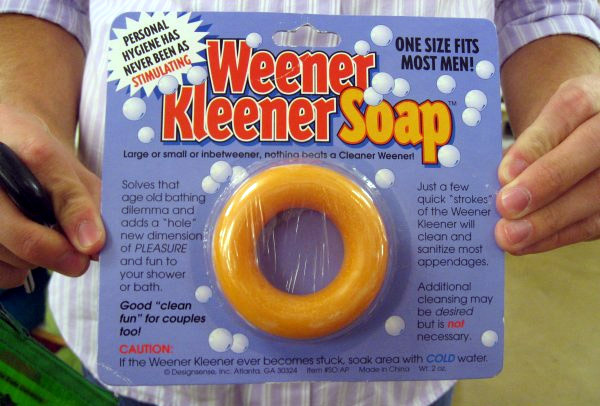 We love Weener Kleener Soap Because it is a great gag gift for any guy. Actually, it is the best gag gift. 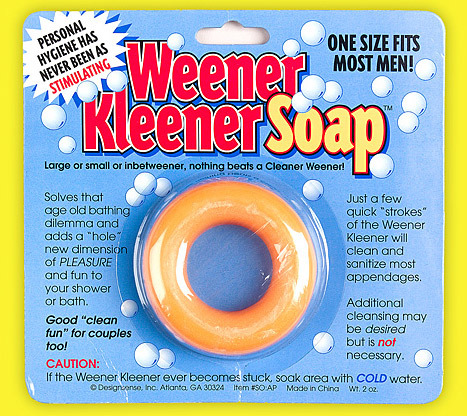 Weener Kleener Soap is the best gag gift because the dude actually will use it—probably over and over again, too. Not to mention the fact that every gift with the word wiener in the title is hilarious. This is hands down the funniest gag gift I've ever given. Awesome.